Our research draws on the disciplines of linguistics, phonetics, pragmatics, speech and language pathology and philosophy, grounding our project on an interdisciplinary approach. The research focus is the language of medical texts (i.e. ancient treatises, illustrative leaflets, deontological codes), diachronically analysed in their lexical, phonological, morpho-sintactic, rhetoric and textual aspects. The results of our first works have proved this approach to play a key-role: studying the medical language from a diachronic point of view can unearth new elements for a deeper comprehension of both the history of medicine and the history of language, demonstrating the appropriateness and fecundity of this interdisciplinary dialogue. 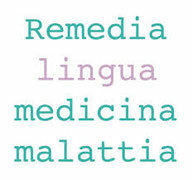 Headed to become a benchmark in the field, Remedia hosted the first Italian Conference on the history of medical language [see], sponsored by the University of Turin and the University of Naples in 2016. For further details about this area of research and its related projects, please visit the section PROJECTS [see]. the different forms of communication between healthcare professionals and patients: therapies based on language, treatment sessions, the informed consent, the communication of the diagnosis and the prognosis, etc. the modalities of communication between healthcare institutions, patients and population. Our research focus is the analysis of oral and written language of psychiatric and neurological patients, adopting both quantitative and qualitative methods, with a particular attention to the last. Along the years we have collected a rich corpus of texts (transcriptions of oral language and original written texts), spontaneously created by patients in a familiar context. To have access to our archive, a password is needed: in order to have it, please send us an email through the section CONTACTS [see] explaining the reasons of your interest.